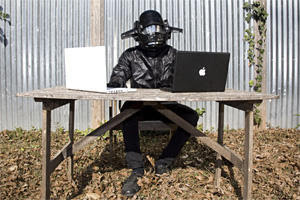 Blog Mule: Is the masked blogger gimmick replacing masked DJs? "I think I am just kind of like a link between 'high-level ideas' and 'people who only have a high school education.'" I am a pretty standard bro. I grew up in suburbia and recently graduated from business school. I now have a "job that I hate" and doesn't really "allow me to express myself." But my day is pretty much taken up by my "real job." I am hoping that ad money will enable me to quit soon. The interview does reveal Carles's motivation for transitioning his site to broader music and social criticism from its origins as a simple mp3 blog. He talks about how he tries to view artists and music from a consumer perspective, as if he were evaluating them as a product on Amazon.com. Overall, the interview provides a rare, however modestly guarded, insight into the man behind one of the most bloggable blogs of the last six months. Read more of Rob Harvilla's interview at Hipster Runoff Explained (Maybe).